← Episode 85 – Welcome Tim! Recently a friend of mine had a battle with a staff member over an Acceptable Use Policy(AUP). It is common to fight with students over these, but rarely with staff. My friend was not asking for anything unrealistic in his well drafted AUP. He actually took the time to produce one AUP for the community, and it was not negative or aggressive. The battle went on for weeks. The teacher refused to even take a school laptop. The teacher even launched an internal email campaign that involved telling the parents the AUP was disruptive to learning. Here is the worst part of the AUP story, the AUP does not matter. It is a completely unenforceable document in an international school. Often, it is unenforceable for students as well. Here is why. International schools are bound by the laws around them. This includes human resource law, liability regulations, insurance practices, etc. Having an AUP say something is not permitted, when it is either permitted or not enforceable in the host country, is a waste of policy. Explaining to the community the local law surrounding the school is always a good idea, and using the law when needed is a good idea. Trying to create your own rules that are not aligned with the law is a bad idea. A sellers market implies that demand is high, and supply is scarce, therefore businesses can charge whatever they want to consumers. AUP language often assumes that a school is in a sellers market, and therefore, can remove teachers and students from the community. Thus also assuming that these people can easily be replaced. The fact is, this is hardy ever the case. Once the staffing is done, and the year begins, schools do not want to try and deal with an HR problem unless it puts the children or community at risk. Many schools have contracts that protect the employee (due to local regulations) and the only way to remove them (assuming they have not broken local laws) is to pay out their contract and/or wait and not renew their contract. Students pay tuition. In most situations, a student gets a pro-rated reimbursement if they leave the school early. In many countries the law forbids the expulsion of students, and forces the school to cope with the problems. Removing students in places like the Middle East can even require numerous lobbying efforts to the ministry of education. Sometimes, legal services have to be paid just to get the paperwork done. Again, many schools will cope with the problem until a point where they are legally allowed to transfer the student out. Schools need tuition to function, and if they are not-for-profit, they certainly do not want to reimburse fees (or pay fees) to have a student removed unless that student is breaking local laws and/or is a danger to themselves or the community. Schools looking for staff are already vetting people as much as they can. They would never consider not hiring someone because that person had a philosophical disagreement with a liability clause on an item worth less than $2000.00. Not having a teacher, means not meeting the contractual obligation the school has with families, and the families are paying tuition. Simply put, as with many things relating to IT, people just do not care. They only care that the majority of teachers work with IT well, and that 100% of the teachers work with children well. They will maintain their agreement to equip the teachers and students unless something very drastic occurred. Right or wrong, a school with a strong subject teacher or department head, is not going to strictly enforce policies that they see as trivial. An adult, with an excellent track record and IT, proficiency should be allowed to manage their own computer. They most like manage far more complex things, and they should not need IT to install software. These are the expectations of most modern professional. Most AUPs cause conflict when they limit access or workflow. What have just written is the opinion of most administrators who are focused on finding good people, who are professional. Reflecting, many AUPs would now seem trivial. Therefore, fighting over the AUP is not the answer to achieving what most Technology Directors want, which are standards that protect the network and equipment. Another approach is required. Is this just Anarchy without Hope? If I loan you (the reader who is not captivated by the heading) my car, and you damage it, you know there is an expectation that you will compensate me for the damage. We do not need a written agreement. Socially, the expectation is applied. Teachers and students know what they own and what they do not own. Therefore, they are aware if they damage something, some compensation is required. The school may wave this compensation, but the expectation is there. As far as network usage goes, if the school cannot afford a filter, then all users will have open internet access. Teachers, as a profession, have an expectation to not expose students to inappropriate content. Teachers breaking that expectation would fall into a different category than those violating IT procedures. An AUP is not where this type of policy should fit, as it connects to the concept of harming children. The AUP should be something people can easily refer to make decisions in gray areas. Such as: How should I properly email parents? The AUP should contain indicators or examples of behaviour that is consider inappropriate for the community. For example, the community might always insist that in group meetings all laptops are put away. The AUP might list areas that will be evaluated in a end-of-year teacher evaluations. The AUP needs to connect to the mission of the school and the vision of the Technology Department. The language should be consistent. This joins the policy to other policies. My Staff AUP is filled with liability jargon. It is not fun, and mainly it is used to notify people that they are responsible for breaking things. I do this out of habit and have a very hard time squeezing money out of staff for damage under $1000.00 USD. The best tool I have for managing behaviour is my IT Ticket system. It has, in great detail, data that allows me to go to a senior administrative meeting and identify individuals who are abusing resources, not responsible for their classrooms, and who repeat the same cycle of break-it/fix-it. This is the data principals need to have conversations with staff, and use for end-of-year evaluations. My Student AUP is not as bad. It is connected to the student disciplinary policy and was written by committee. At no point does my AUP indicate it has the power to remove a student from the academic program, it only allows for network management and/or banning of services, to be decided by the academic office. 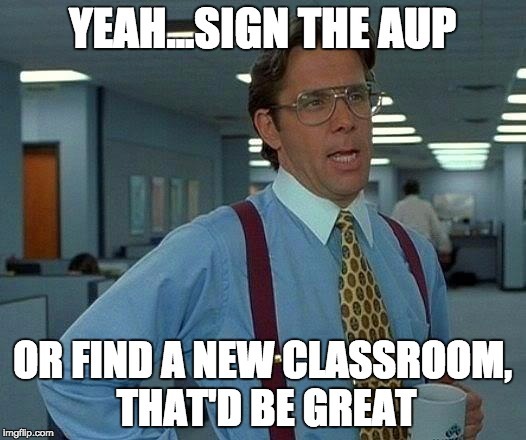 The AUP is actually to help the academic office make decisions. Writing policy is important. Writing unenforceable policy is a waste of time. Find the balance, research your local laws and guidelines, align with other people, and use the community to manage the individual. This entry was posted in cyber awareness, Educational Technology, Instructional Technology, Opinion and tagged AUP, Contracts, Leadership, policy. Bookmark the permalink. Hey Tony. Bummer about your friends experience. In my 6 years as a tech director, I’ve had three cases of faculty breaking their equipment. Here’s another wrinkle that changed our language about AUP’s. Minors legally cannot assume risk. A minor (under 18) cannot legally assume risk for anything (this is why a minor cant rent a car, for example). So we changed our AUP so it was the parents who assumed the risk. As part of our enrolment contract we have a standard clause “I assume all risk for anything that breaks”. I must take exception to the idea of social contract with teachers. It’s kind of weird, but I’ve found teachers think of the computer as “theirs” – this is good because they spiritually “own” the computer and use it to the fullest. But when it gets damaged, the social contract become muddy and unclear. It’s weird. Your car analogy is perfect. But when a teacher breaks their computer, it’s weird. To the big idea of your post: that AUP’s are often full of policy, procedures, and ignored, I must plead mea culpa. Our AUP is more of a C.Y.A. document than a meaningful exchange with students and teachers about technology and learning.